We asked the BuzzFeed Community for their favourite ever moments. If you haven't watched every episode, prepare yourself for a few spoilers. We asked the BuzzFeed Community, BuzzFeed Staff and Twitter for their favourite ever BBC Bake Off moments, to mark the final series on the channel. 1. THE #BINGATE SITUATION, when Diana mistakingly took Ian's baked Alaska from the freezer. It caused Diana to have this face. And made people react like this. Even though Sue Perkins made this point. Suggested by Katy Barr on Facebook, who added: "It's all I ever spoke about for a couple of weeks. WHO TAKES ICE CREAM OUT OF THE FREEZER!?" 2. When Paul made a FANTASTICAL BREAD LION. It led to wonderful parodies like this. Suggested by Sophie Hudson on Facebook. 3. When some dough was accidentally thrown into the air and landed on the green carpet. It was then suggested to serve it with some carpet bits in. This did not go down that well. Suggested by Chiara Thomas on Facebook. 4. When Mel and Sue had a fight over mousse. Suggested by Caroline Cecena on Facebook. 5. Nadiya's absolutely amazing facial expressions. 7. When Norman said that pesto was very exotic. Suggested by Katy Archer on Facebook. 8. And when he spelled "B-A-K-E" with semaphore. 9. Tamal and Nadiya's exceptional friendship goals. Suggested by Maha Chaudhry and Tom McAteer on Facebook, who said: "Especially when he called her his 'little friend.'" 10. When Flora said the most middle-class thing. Suggested by Flo Perry, BuzzFeed Staff. 11. And then there's the little matter of Selasi. Suggested by Jamie Jones, BuzzFeed Staff. 12. When Mary asked Enwezor whether he made his own fondant and he admitted that he bought it. 13. When Sue accidentally leaned on Howard's muffin. 14. When Mel asked Alvin this. Suggested by Philippa Hudson on Facebook. 15. When Nadiya was exceptionally sassy to Paul. Paul: "Happy Nadiya?" Nadiya: "Happy Paul?" Suggested by Steffan Danino on Facebook. 16. James Morton's exceptional jumpers. Suggested by Cameron Giles on Facebook. 17. When Luis made a doughnut cocktail and Mary Berry couldn't have enough of it. 18. 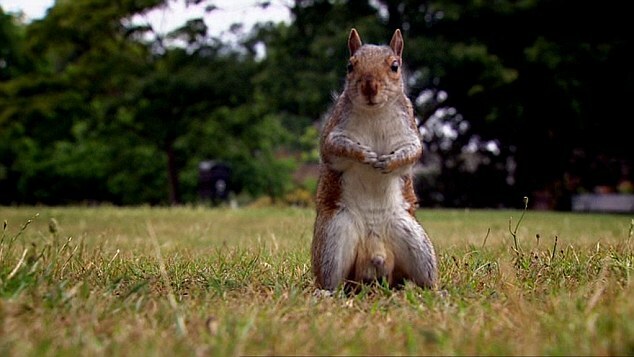 When we saw a squirrel with huge testicles. Suggested by Kirsty MacKenzie on Facebook. 19. When Nancy's machine malfunctioned a bit. Suggested by Scott Bryan, BuzzFeed Staff. 20. When Deborah used Howard's custard by mistake. 21. When Tamal summed up our life. And then said this during another challenge. Suggested by Laura Renee Williamson on Facebook: "Pretty much anything Tamal said during his season was gold." 22. When Mat mistakingly put his tennis court cake icing into the oven instead of the freezer. Suggested by Miranda Keedy on Facebook. 23. When Nadiya became exceptionally sassy. "For filing it away, in the folder that says NEVER BAKE AGAIN." 24. When Selasi pretended to be Mel and Sue. Suggested by Eleanor Bate, BuzzFeed Staff. 25. When Nancy kept calling Paul "The Male Judge." Suggested by lauram4d04b7b30 and Shani Hilton, BuzzFeed Staff. 26. When Mary said the most WTF innuendo..
27. When Val came out with these wonderful words. Suggested by Cassie Smyth, BuzzFeed Staff. 28. When Nadiya pointed at her trophy and herself when she won the Great British Bake Off. Suggested by Charlotte Fowles on Facebook: "She was so overwhelmed she couldn't even speak." 29. And when Nadiya came out with this speech. 30. And when Mary cried when it was all over, which is like a lot of us right now. Submitted by Caitlin Colebeck on Facebook, who added: "I feel like it shows how much it means to people and how life changing it can be." VOTE: What is your favourite moment?